Wii Sports is a Wii launch title developed by software development group no. 2 of Nintendo EAD. 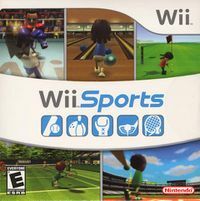 The game consists of several sports games, such as tennis and boxing, which can be played using Miis created on the Mii Channel and make heavy use of the Wii Remote's motion features to show off the technology, allowing players to perform in-game actions, such as swinging a tennis racket or baseball bat, in a realistic manner. The game was first released in North America in November 2006, and in all other major regions in December. Wii Sports was the first game since Mario's Tennis for the Virtual Boy to be bundled with a Nintendo console, being sold as a pack-in game with Wii consoles in all regions except Japan. In part because of it being a bundled game, Wii Sports has sold over 86 million copies worldwide, making it the best-selling Wii title, the best-selling title for a single platform, and the third best-selling game of all time. Transform your Wii Remote into a baseball bat, tennis racket, bowling ball, golf club, or boxing gloves, and turn yourself into an instant sports superstar! Put yourself right in the game as a Mii – a personalized and customizable Wii version of you! Don't feel like a pro? Pick up the skills you need in over a dozen training games, or just shoot for the best score! Wii Sports features a total of five sports: tennis, baseball, bowling, golf, and boxing, in which players, as their Mii character, use the Wii Remote (or Nunchuck) to simulate playing the actual versions of the sports. In tennis, players use the Wii Remote to swing their character's racket. In baseball, players pitch and swing by performing said actions with the remote. In bowling, players swing the remote like a bowling ball to play. While playing golf, players swing their Wii Remote like a golf club. Finally, in boxing, players must making punching and guarding motions with both the Wii Remote and Nunchuk to play. In playing these games, players are rewarded or deducted skill points based upon their performance relative to their computer opponent. Increasing one's skill points earns the player several aesthetic features, such as a larger crowd for boxing and tennis, and a new outfit and ball for bowling. In addition to the main sports, players can also play various challenges based on each sport. Players can also take a daisy fitness test, which judges the player's "fitness age" based on their performance in three randomly-selected challenges. EU: May 20, 2011 A re-release of the game under the Nintendo Selects branding. KOR: November 6, 2014 A compilation version of both Wii Sports and Wii Sports Resort. ↑ Nintendo Drops Price of Wii to $129.99, Includes Both Wii Sports and Wii Sports Resort. Business Wire (October 15, 2012). Retrieved May 6, 2017. This page was last edited on 6 May 2017, at 18:42.